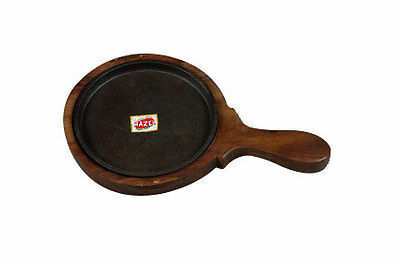 Wooden base with size 13"x 8.5"
Hazel Sizzling Brownie Sizzler Plate with Wooden Racket 7 inch Round allows you to cook amazing sizzlers and brownies now at home. You can cook them anytime you wish to have them. The Sizzling Brownie Sizzler Plate has an approximate wooden base with size 13"x 8.5" and approximate Iron Plate Size 7 Inch Round. This is light weight and extremely durable and the handle gives you ease while serving. Iron plated metal plate and wooden base comes int he best quality. How better than having Sizzling Sizzlers, sundae or Hot fudge sundae or sizzling hot cake on a hot plate topped with chill ice cream and chocolate sauce. The sizzle and smoke would give you an adrenalin rush for sure. Though it looks like a fancy dish served at restaurants, its pretty simple to make at home and the satisfaction and praise that you get for making it from scratch is priceless. Making some spicy sizzlers for starters or a sizzling sundae for dessert would be the best choice to give a most memorable dinner party for your invitee.